I moved to Melbourne from Edinburgh for the festival spirit: both are cities of ideas, curiosity, and great arts programs. I’m often asked about the differences between the two, besides the weather and the geography, and while I make jokes about dark winters and castles I can’t separate their personalities out from their locations. Melbourne has a clear central hub, a massive sporting infrastructure and a busy business district. Its cultural events draw people from many hours away, with events taking place indoors, outdoors and at venues throughout a city whose daily work/shop/study routine doesn’t pause, unless you creep away to look from the nearby peace of the riverbank. I’ve only seen this town really stop twice: once for the Grand Final footy parade that peculiarly takes place before the big match, rather than as a victory march. 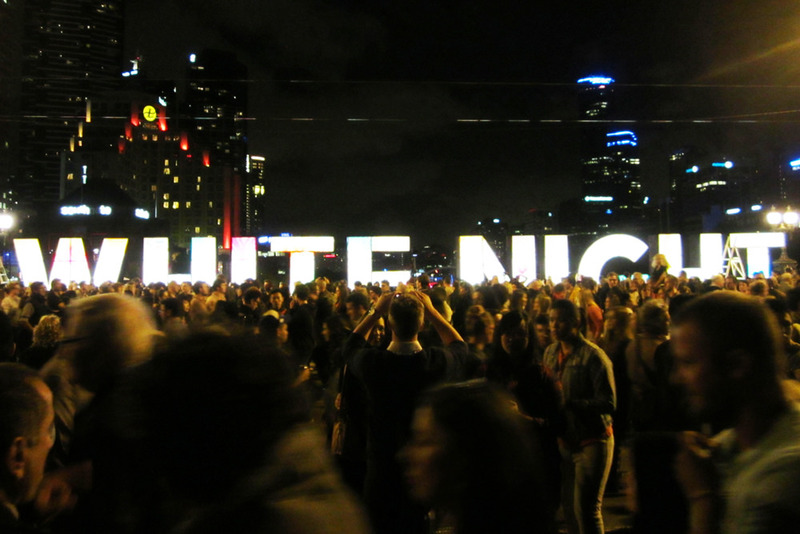 The other occasion is White Night, a one-night carnival of crazy in the CBD that drew crowds of half a million in 2014. While I have some strong reservations about this event – the crush in some of the crowds is terrifying, the funding levels require interrogation, the relationship with the existing arts scene needs to be actively nurtured – big, splashy events are important. They make a statement about a city’s personality and its intentions, and it’s hard to argue with an event that so visibly brings a sprawling city together to experience art and dance and music and literature. Sense of place intimately affects the nature of the festivals that their cities produce – space impacts structure, influences audience reaction, changes opportunities that strangers and friends have for shared experiences. I’ve had to adjust the way I build events so they work for audiences, from simple alts around cloakrooms (not required in 40+ degrees!) to timing sessions to allow significant travel time. This is particularly necessary when taking into account regional impact – people are prepared to drive for long distances, and deserve a thoughtful program that takes their journeying into account. Like her Scottish City of Literature counterpart, Melbourne has a significant academic community and also does a wide trade in conferences. I’ve been thinking about the differences between festivals and conferences, and how the best examples have the same ingredients. Each has a clear program identity, provokes new ideas, introduces quality speakers and provides time for social connections within the audience. So often it’s a combination of personal discovery and validation: your interests or work subjects are shared and celebrated by others, and new iterations are presented. I see that in action in the gaming events, the library lectures, the teaching meet-ups that go on across town. They aren’t festivals though: a festival space has a time limit, a deadline the squeezes a community together in one environment, hothousing the debates. I saw the combination of discovery and community at the recent Pause Fest: a design industry that did not get enough chances to meet one another and compare notes. While Pause knows it has an opportunity keep opening its program to a wider creative audience (and to actually have some women on the bill) it seems to know what its core heartland of design professionals are looking for. Festivals are hard yet joyous, because they are not just immersive experiences for the audience: they take over the lives of the fine people that run them, design them, program them, communicate them, find funding for them and dream about them at 3am. The idea of your festival constantly insists on being better, on reaching more people. If this doesn’t happen, then your event is not pushing enough boundaries, which is part of what the best festivals are about. Festival audiences – how we cater to them, excite them, talk with them and yet push them into uncomfortable new worlds – are a whole other post though. Another time. For now, I’m off to wander the late-summer laneways and search for my next festival experience.